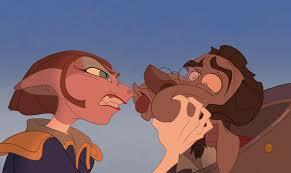 I didn’t originally want to see this Disney movie when it came out in 2002. Don’t get me wrong, I already liked pirates, and enjoyed the particular genre of steam-engine space tech called steam punk. But I firmly believed it was a flawed concept. Space movies should be space movies, and not hijack the immortal work of Robert Lewis Stevenson. A friend dragged me to the movie, and I fell in love immediately. The basic tale – boy meets pirate, boy has father/son relationship with pirate, pirate reveals his true nature, boy overcomes pirate, pirate escapes with a pocket full of treasure, is known to practically everyone. But Disney cartoons have a well-known habit of “cleaning things up” I hadn’t wanted a sanitized version. I’d also felt that the “space” part of the space adventure would be just tacked on. Instead, I found a lot “right”. The brown-and-gold color scheme of the movie works with the steam punk theme. The wide variety of aliens gives the piece an exotic feel, while letting Disney do anthropomorphic animals, something that Disney does well. One of the things that advertising for the movie touted was the blending of computer-generated art with the more traditional hand-drawn style. This, too works amazingly well in the piece. The enormous sweep and movement of the ship (whose name has been changed from the Hispaniola to the R.L.S. Legacy – Robert Lewis Stevenson’s Legacy) is only enhanced by the abilities of CG. And the mechanics of Long John Silver’s cyborg arm (for in this, he’s not just a one-legged man, he’s a cyborg) is wonderful. And the story, while it’s been changed a little (movie version tend to do this) is both true to the spirit of the original and relevant to modern audiences. We open with Jim Hawkins as a child, reading a pirate story. This “pirate book” shows holograms of the action, so we get a quick mini-movie of Captain Flint zooming in to attack a merchant/passenger ship, before disappearing off into empty space. 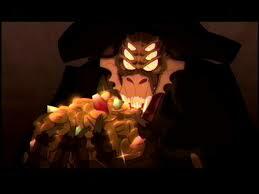 This sets up the mystery of the treasure right off, and shows off the terrifying visage of Flint. As a pirate-historian, I also note that the proportions between the pirate vessel and the merchant are correct. Flint’s ship is much smaller. 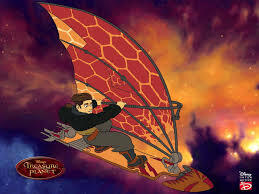 Next the movie cuts to Jim as a fifteen-year-old, riding a cross between a skateboard and a para-sail. While he’s joyriding, his mom and Dr. Doppler (who replaces Dr. Livesey and is an obvious descendant of Goofy) chat about how Jim’s father ran out on the family, Jim’s mother is overwhelmed trying to run the Benbow Inn by herself. Clearly the family is reaching a crisis, exacerbated by Jim’s run-in with the law over his midair stunts. Next comes a fast-paced sequence. Billy Bones crash-lands near the Inn and is rescued by Jim. The treasure map is discovered. Bones dies of his injuries. The pirates arrive hard on the heels of Bones. They tear the Inn apart, looking for the map, and end by setting it on fire. What takes six months in the book blows past in an hour, about 5 minutes screen time. Now we’re in the heart of the story. Jim figures out how to open the projector for the map’s holographic images (great effect) and Dr. Doppler agrees to finance the mission to find the treasure. In no time, we’re at the spaceport, seeing the RLS Legacy and meeting Captain Amelia and her first mate, Mr. Arrow. Captain Amelia, a cat-like alien, is an Disney addition. Stevenson’s captain was male, of course, but a hyper-efficient female captain works very well, while giving the little girls a fine role-model. Amelia also provides inspiration for Doppler to find his inner hero, at which times she becomes a romantic figure. 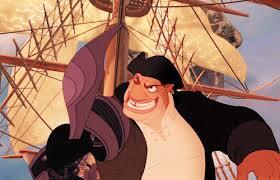 The depiction of Long John Silver in the movie is, of course, what “makes” it. You can’t have any version of Treasure Island without a really good Silver. Brian Murray does the job as well as anyone ever has – His Silver is funny, smart, almost overwhelmingly full of personality, and, when the moment calls for it, terrifying. Silver’s first job is to take Jim in hand. His actions – teaching the boy about how to pick his fights, demanding hard work from him in Jim’s work as cabin boy, telling tall tales and speaking to Jim about what makes a man a man, put him squarely in the “father figure” role. In the book this doesn’t come out nearly as strongly. And in many live-action versions Silver is responsible for the death of Mr. Arrow. In this version, however, Silver is softened by giving this job to Scroop, the insectiod bad guy of the piece. 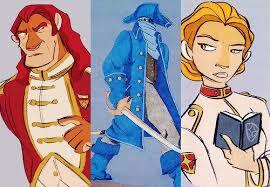 Stevenson wrote a more realistic story by making the pirates their own worst enemies. They get drunk and disagree and fight among themselves. Disney doesn’t have time for that. He does the dirty work of killing Arrow, but Silver surprises and horrifies us by telling Scroop that the timing (not the murder itself) was wrong. 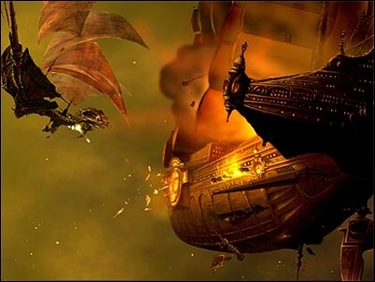 In this version, Silver starts his mutiny on the ship, beginning a frightening gunfight and gives the pirates a chance to hoist the Jolly Roger. At this point, when Jim escapes Silver’s clutches by stabbing him in his cybernetic leg, and the blaster-fire is thick, we truly see Silver as a pirate, greedy, self-serving and ready for violence. 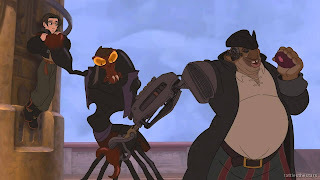 On Treasure Planet, we meet the robot navigator B.E.N. (in place of the maroonee Ben Gunn) and Dr Doppler begins to lose realize that, while he may need to dither about the unimportant things, when life and death are on the line he’s a man of action. Captain Amelia is no less the hero, however. In Treasure island, Stevenson shows us Silver standing up to the other pirates to save Jim. 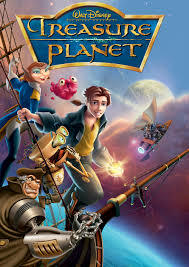 In this movie, he literally gives up his treasure for the boy, and in return, Jim uses his skateboard/sailing skills to save the entire party from an exploding planet. In this version the treasure (loot of a thousand worlds) is so vast that it MUST be disposed of, since anyone with so much wealth must necessarily be stuck with a whole slew of new problems. At the end, Jim catches Silver sneaking away, and does not alert the others, even though he now knows what Silver is. And the pirate gives Jim just enough treasure (pulled from the copious pockets of the pirate coat) to re-build the destroyed Benbow Inn. Captain Amelia sends Jim to the Space Academy, she and Doppler marry, and the robot B.E.N. moves into the Inn to help Jim’s mom with the work. All is well, and Jim feels the presence of Silver watching him. We are safe, knowing that the pirate still roams free. 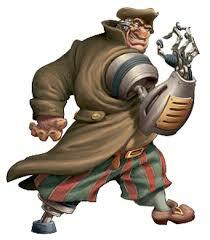 Disney built a very believable world/universe for Treasure Planet, with a steam punk design of 70 percent “old” (antique clothing, beamed ceilings, furniture, tools) and 30 percent “new”(solar sails, ray guns, cybernetics) They tried out the esthetics for Long John Silver’s prosthetic arm and leg by first attaching it to another hand-drawn pirate – Hook. They also left in a lot of the scary bits. Arrow’s death – falling into a Black Hole – is more graphic than his ending in the book, when he simply disappears between night and morning, presumably pushed into the sea by Silver. Disney also kept In a terrifying one-on-one fight to the death between Jim and Scroop (standing in for the pirate Israel Hands). Disney couldn’t keep all f the fight, of course. In the book, Jim has a flintlock pistol, and threatens to shoot his pursuer in the face. 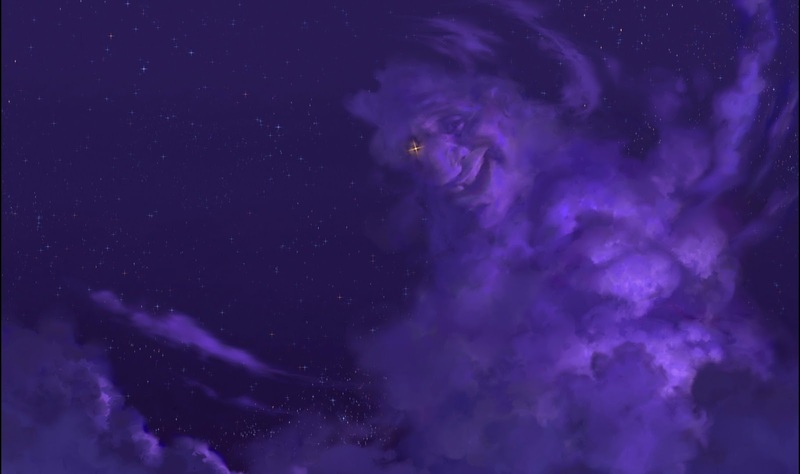 In Treasure Planet, Scroop’s’ fate – flying off into space when the gravity fails – mimics the death he gave to Mr. Arrow. Things I especially like about the show? Jim’s tortured, bad-boy character, barely masking a lonely child. The entire relationship between Jim and Silver. The older man is hard n Jim, and we see what Jim needed that his mother couldn’t give him. But we also see genuine affection. Silver even hints at some of his own back-story, admitting that he gave up a lot to search for Flint’s treasure as he rubs at his mechanical leg. The depictions of Flint are also excellent. The character of Flint has no first name in Stevenson’s book, and the choice her o of “Nathaniel” works for me. The pirate captain’s six-eyed face is terrifying, and lets us identify his skull at a crucial moment. Just the robot B.E.N., whom I think Is just there to be cute. I hate cute. All it all, it’s really one of Disney’s better efforts. But the movie didn’t do well in theaters. A lot of people probably shared my confusion about Treasure Island in space. But Netflix has given it a second life, and it has also taken on a cult status with the Steampunk crowd. 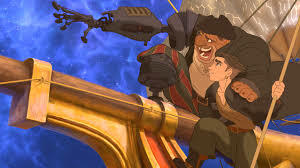 Disney had originally planned a sequel, in which Jim, while in the Space Academy, gets involved with the theft (by pirates) of a prototype super-ship designed by Dr. Doppler and armed with a mega-weapon. Silver gets called in from his smuggling business to help out, and Jim finds romance with the Admiral’s daughter. It would have been a grand romp. And now… Who can tell? 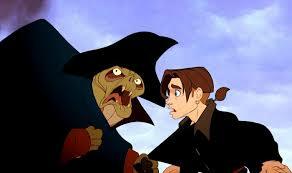 The popularity of Treasure Planet is growing, not shrinking. We may see that sequel yet. I watched this movie for the 2nd time yesterday and enjoyed as much as I did the 1st time. You're right : syfy and steam-punk does get along pretty well. 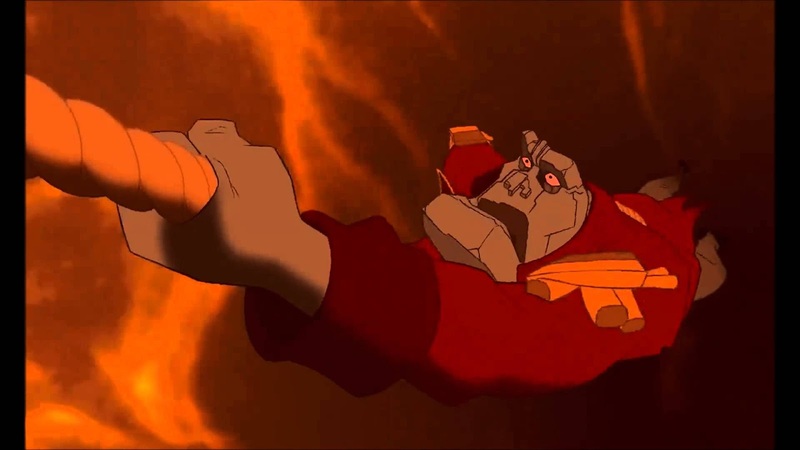 Scientific laws aren't respected at all in this movie, but who cares : it's a Disney and it doesn't bring prejudice to it (it even gives more drama to the drama when Mr. Arrow or Scroop "fall" into space due to gravity lack). Anyway, nice article and I'd love to see a sequel of that movie too.